Download a "nine planets" screensaver for your computer with spectacular photos of our solar system, and you'll notice that one planet is conspicuously missing: Pluto. Icy and mysterious, Pluto is the only planet never visited and photographed by NASA space probes. In fact, the clearest image we have of Pluto is a tiny, pixelated blob of light and dark patches taken by the Hubble Space Telescope in 1994. It's tantalizing &md; but not much more. Earth-based telescopes have succeeded, however, in discovering one amazing fact: Pluto is not a lone world, but a double-planet system. Its companion, measuring about half the size of Pluto itself, is named Charon. Work is underway to launch a robotic probe to visit and photograph Pluto and Charon. The project, called New Horizons, will map both worlds. 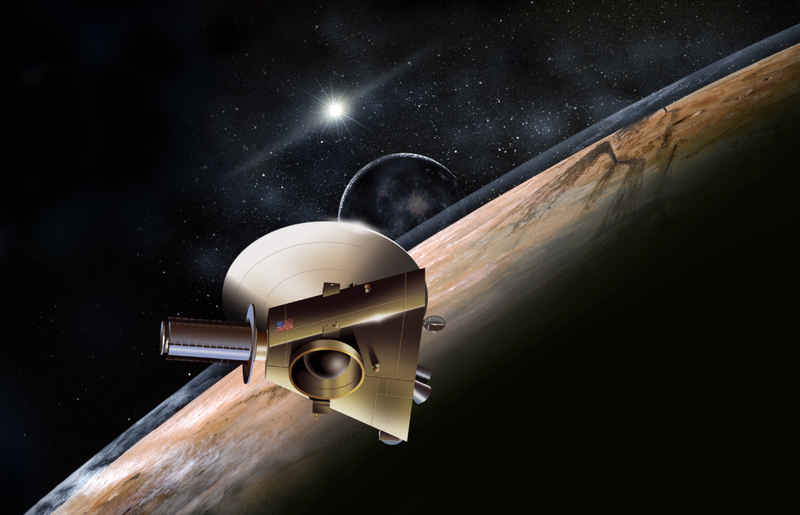 Sensors will chart surface minerals and ices, and catalog the gases that make up Pluto's wispy atmosphere. "It's the second epoch in the exploration of the planets," says Alan Stern, the principal investigator for New Horizons at the Southwest Research Institute in Colorado. "We're going to the very edge of the solar system." The probe is scheduled to launch in January 2006. Its journey will be a long one. Pluto is more than 30 times further away from the Sun than Earth is! Even with a speed boost from a fly by of Jupiter, the probe won't arrive at Pluto until July 2015. Afterward, the probe will venture on to explore the Kuiper Belt, a distant "halo" of small, frozen objects surrounding the solar system, from which comets originate. Aside from sheer curiosity about these distant worlds, scientists are motivated by questions about the formation of the solar system. Orbiting in the deep freeze far from the sun, Pluto and Charon have undergone less change than the inner planets during the solar system's 4.5 billion year history. These two worlds will provide a glimpse into the past. Pluto could also shed light on the origin of our own Moon. Earth, with its single, large moon, is unusual. The Pluto-Charon system is the only other pair like it in the solar system. In fact, some astronomers consider Earth and the Moon to be a double planet, too. So knowing more about Pluto and Charon could give clues about how the Earth-Moon system formed. And, of course, the spectacular, up-close photos of Pluto and Charon are going to look great as a screensaver!